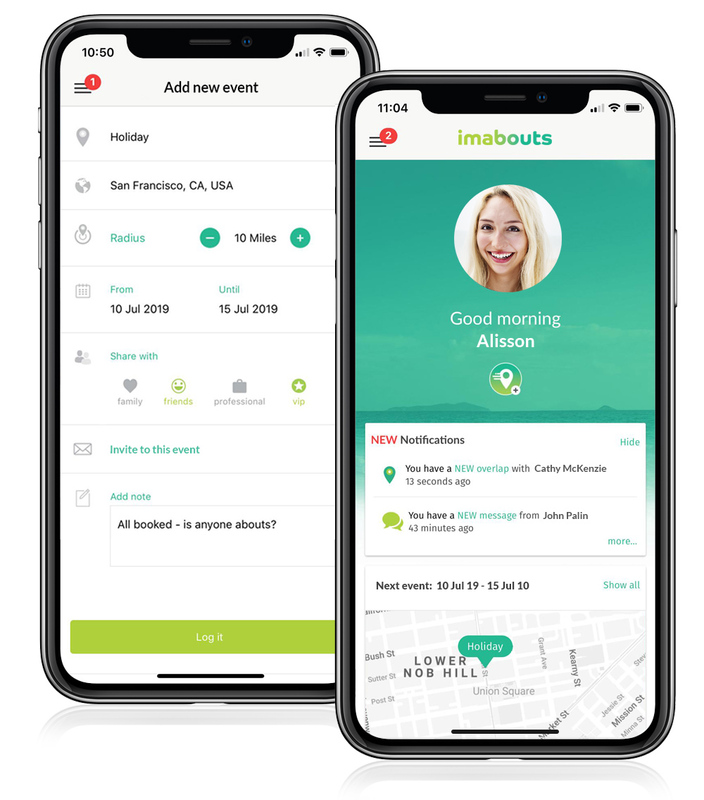 At imabouts, we are focussed on making it easier to get together with the people you want to meet. We let you know whenever your current or future plans overlap with those of your chosen contacts, and give you the option to get in touch... meaning that you never need to miss another opportunity to get together. Add your plans, select your chosen contacts, and we'll let you know who is about - simple as that! Log your current whereabouts or any upcoming trips, holidays, business conferences - even a night out or going to the gym - basically any event where you would like to meet with your chosen contacts. Create your round-abouts network and set a relationship status for each of your contacts. Invite from your phone or see if any or search in "my network"
If any relevant contacts are going to be in the same place at the same time - we'll let you know! Logged within seconds with immediate notifications if any chosen contacts are nearby - takes the chance out of potential chance meetings! Your future plans and events - advanced notifications if anyone from your chosen contact groups are also going to be around the same place at the same time - letting you make arrangements to meet ahead of time!